Chelsea striker Samuel Eto'o will be out of action for about two weeks, the club said on Friday. The 32-year-old Cameroon international was stretchered off during Chelsea's 1-0 defeat away to Basel in the Champions League on Tuesday. 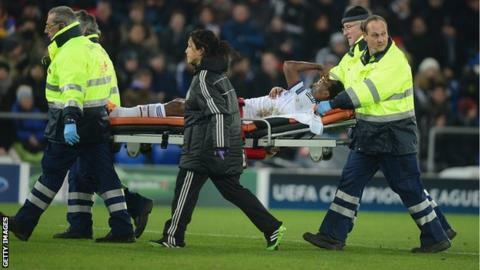 Manager Jose Mourinho said Eto'o had suffered a "grade one muscular injury" to his hamstring. Eto'o has scored four goals for the Blues since joining from Russian club Anzhi Makhachkala in the summer.